The measurement of safety in the workplace traditionally emphasizes evaluation of company regulations based on outcomes. In other words, shaping company policy and standards to reflect the risk of adverse events after the fact. Though the occurrence of an incident in health, safety or the environment always occurs as a surprise, there are distinct features that can lead to significant risk mitigation. At the bottom of this prediction, lies data. How and to what quantity this data is collected and analyzed is what separates those companies who successfully minimize risk events from those companies who do not. 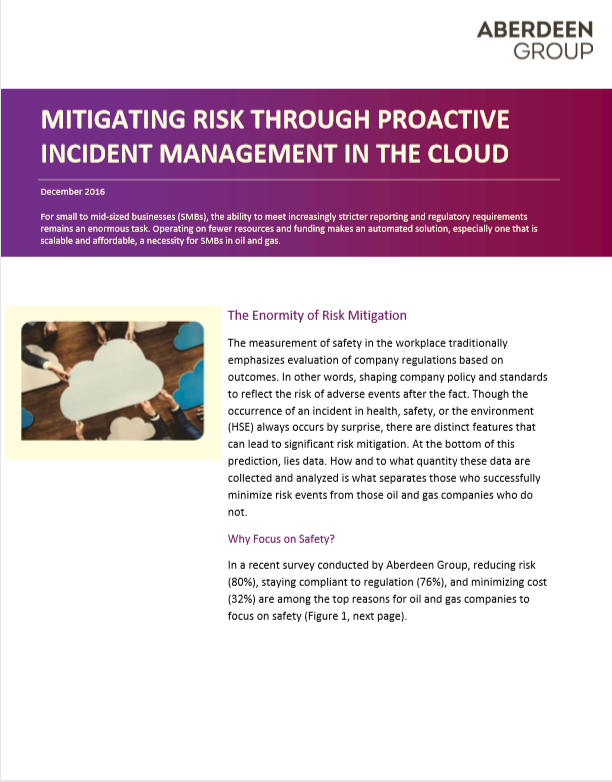 In a recent survey conducted by the Aberdeen Group, reducing risk (80%), staying compliant to regulations (76%) and minimizing cost (32%) are among the top reasons for companies to focus on safety.